Results sharing is a natural and inherent stage of scientific research. It makes a good opportunity for scientists to talk in depth about the research results and to obtain a valuable feedback from experts. The challenge often though is to go beyond the hermetic environment of experts and outreach wider, non-scientific and non-expert audience. How is that different one might ask? Here is the answer. Forget about a jargon and complex phrases. Make your talk understandable, clear and transparent. Make your audience engaged and interested. Because it is all about raising awareness and spreading the word about the project! This November 2016, I had the opportunity to share some p4ges results with an audience of Polish diaspora during Science: Polish Perspective (SPP) which is a popular science conference held in Saïd Business School in Oxford. SPP is an initiative organised by Polonium Foundation. 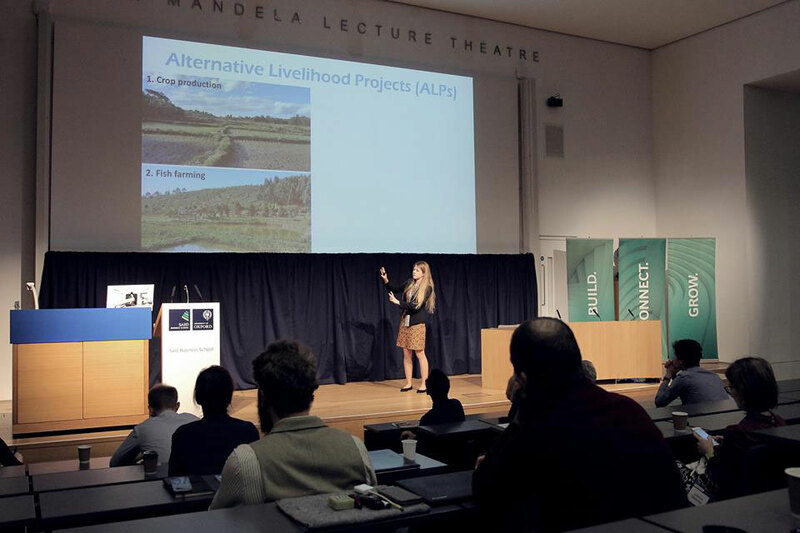 I worked as a research assistant to p4ges last year and I gave a presentation called ‘Do we need to choose between nature conservation and people’s well-being? Searching for an optimal solution in Madagascar’. There was a large (about 240 people) diverse audience. The audience included representatives of various scientific domains including the biology, medicine, biological engineering, physics, astronomy, chemistry, agriculture and sustainability, and many non scientists including representatives of the business sector. The audience was also very diverse in age. The key motivation behind my talk was to raise the awareness about exacerbating global problems of deforestation and poverty. And more importantly about the approach of how to solve them. I talked about the idea of achieving poverty alleviation and biodiversity conservation together – the main objectives of P4ges project. During my presentation, I tried to engage with the audience through letting them to imagine being in shoes of typical Malagasy, who lives in poverty and has no other source of income than tavy. The audience was shocked with both the poverty levels and the rate at which forest in Madagascar is disappearing together with all its biodiversity and ecosystem services that we all depend on at no exception. I also explained what P4ges project is about, focusing on the concept of Alternative Livelihood Projects (ALPs) and shared out results looking at peoples satisfaction with implementation of alternative livelihood projects. For many attendees, the presentation about P4ges was eyes-opening. Some even admitted that it was really important as it touched upon a very sensitive point which concerts many scientific disciplines where the interest of people, especially local communities, is not considered with high enough priority. This is a common thing, however often swept under the carpet. My presentation was so well received that I received the award ‘People’s choice best presentation at Science: Polish Perspectives 2016 Conference’. See here for my slides.